Redmond Conditioner is a trace mineral colloidal silicate which contains a combination of over 50 mineral compounds. The group of minerals are colloidal which means they are in a condition ready for immediate utilization by the animals. 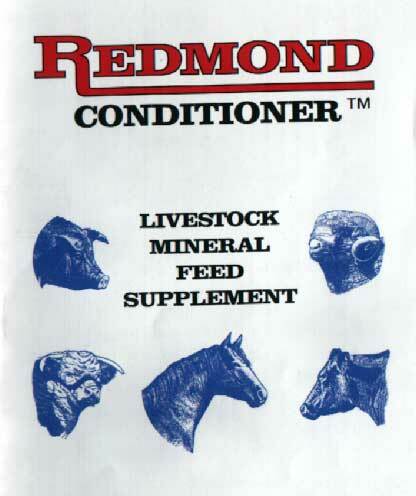 Redmond Conditioner is a mineral supplement. It allows animals to better utilize their feed intake, thus gaining more weight on the same or less feed. Many researchers are convinced that some diseased and unhealthy animals are a result of trace mineral deficiency. Most trace minerals should be supplied by the food animals eat; however if animal feed is grown in mineral deficient areas, the result is mineral deficient grains, alfalfa, corn silage and grass. Trace mineral colloidal silicates are not a major cure, but it is an established fact they play a major role in animal health, condition, and prevention of disease. Beef Cattle - feed lot operators report better weight gain, and feed conversion in spite of aflatoxin contaminated feed (1). Feed 4 ounces per head per day for maintenance level. Dairy cattle - dairymen report reduced somatic cell count, overall better health and a reduction of aflatoxin levels in milk. (2&3) Feed 4 ounces per head per day for maintenance level. Horses - horse breeders report glossier hair coats and more responsive and healthier animals. Feed 4 ounces per head per day for maintenance level. Hogs - Reports say better feed and growth rate inspite of contaminated grain (4). Feed .5% added to feed ration. Sheep - Sheepmen report higher wool production and overall better health (5). Feed free choice. Poultry - Chicken and egg producers report less disease, harder shells, less breakage, and better feed conversion. (6) Feed 1.5% added to feed ration. When using this program, any bicarbonate of soda should be removed from the ration. 1. Montana Farmer-Stockman, March 2, 1972. 4. Influence of Mycotoxins in Pig Production, ,M.D. Lindemann. 6. Poultry Research Institute, Abdul Waheed Sahot and Bishir mahmood Bhatti. Contains the following minerals Calcium, phosphorus, magnesium, sulfur, beryllium, titanium, tin, chromium, sodium, lithium, potassium, boron, aluminum, silicon, plus 31 other natural minerals. Redmond conditioner is available to improve the nutrition, health and profitability of your animals. Customer Report - A dairy in Texas was averaging 4000,000 somatic cell count. After using Redmond Conditioner, they reported that the count dropped 50,000 per month. The latest report was that the count was averaging 200,000.